Making a Living, a 1914 comedy short produced by Mack Sennett, is the film in which Charlie Chaplin made his screen debut. Playing a character known only as “the Swindler”, Chaplin cons an unsuspecting dupe (director Henry Lehrman) out of some money, and then heads over to woo the poor guy’s sweetheart (Virginia Kirtley), the daughter of a wealthy socialite (Alice Davenport). When the guy (who we soon learn is a reporter with a small newspaper) is rejected by his sweetheart, a fight ensues between him and the Swindler, ending with the reporter being tossed out on his ear. Later that same day, the reporter is walking down the street with his camera when he spots a car wreck in progress, snapping pictures of the crash as it occurs. When the reporter pauses to free the driver from the wreckage, the Swindler happens by and steals his camera. Rushing back to the newspaper’s front office, the Swindler claims credit for the pictures, which are immediately printed on the front page of the latest edition. The rest of the movie involves the reporter trying to chase down the Swindler, with the Keystone Cops popping up every so often, falling all over themselves. Making a Living is the only short Charlie Chaplin ever made that didn’t feature his tramp character (which debuted in his next film, 1914’s Kid Auto Races at Venice). 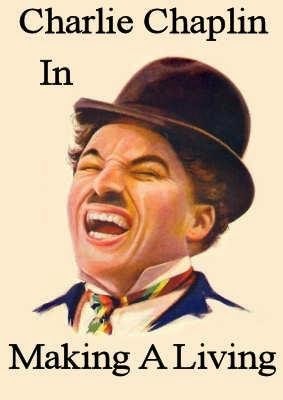 What’s more, Making a Living differs from the actor’s later works in that it’s a straight-up slapstick comedy, with Chaplin performing a number of pratfalls throughout (tumbling down stairs, being knocked over by a pile of newspapers, etc). Still, despite the fact it’s his very first outing, Chaplin has an undeniable screen presence, and even manages to steal the movie from the more experienced Keystone Cops (who, admittedly, play only a minor role in the film). Clocking in at a brisk 13 minutes, Making a Living gave audiences of the day their first glimpse of a performer who, in a few short years, would establish himself as one of the cinema’s most iconic superstars.